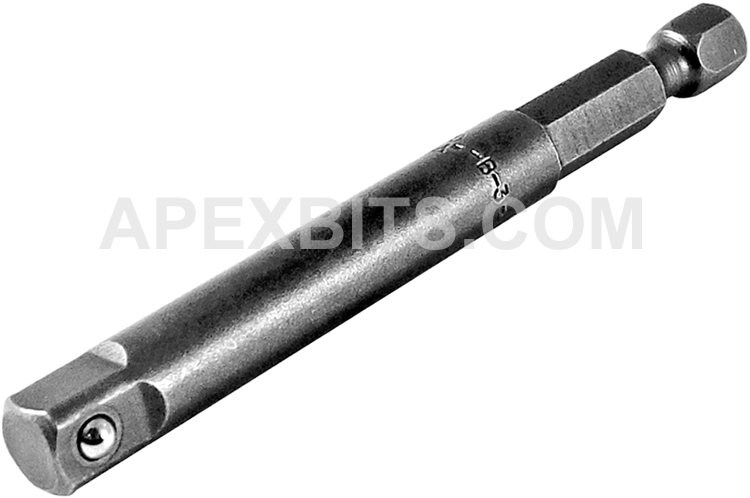 Apex male hex power drive extension with 1/4'' male square from Apex Fastener Tools formally Cooper Tools. Apex extensions have hex tolerances that are on average 48% tighter than DIN and 35% tighter than ANSI requirements. With Apex Fastener Tools, the industry leader in drive extensions, you are assured of an exact, sure fit. The EX-250-B-3 Apex Brand Power Drive Extension, With 1/4'' Male Square is one of thousands of quality tooling products available from MRO Tools. Please browse Apex Male Hex Power Drive Extension, With 1/4'' Male Square for tools similar to the EX-250-B-3 Apex Brand Power Drive Extension, With 1/4'' Male Square. EX-250-B-3 Apex Brand Power Drive Extension, With 1/4'' Male Square description summary: Apex brand male hex power drive extension with 1/4'' male square. Hex Drive (in. ): 1/4'' Type of Lock: Ball Overall Length (in.) 3'' Opening Depth (mm) 76mm Quantity discounts may be available for the EX-250-B-3 Apex Brand Power Drive Extension, With 1/4'' Male Square. Please contact MRO Tools for details.